This article is one of a series from our Etowah to Etowah in six hours road trip. Our family consists of us parents and one of our college students on this trip. We had a blast driving the skyway and taking photos from the overlooks. Both of these photos were taken from the Unicoi Crest overlook on the Cherohala Skyway. If you come from our direction in Tennessee this stop is just across the North Carolina line. It doesn't take long to appreciate the view. On the day that we were there the mountains and sky almost merged together. It was heading toward evening. 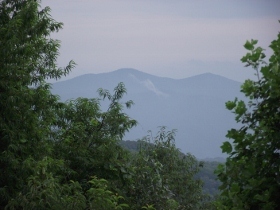 The Unicoi Mountains are a small part of the Nantahala National Forest in North Carolina and part of the Cherokee National Forest in Tennessee. 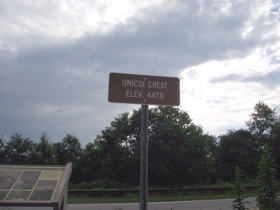 The Unicoi Crest is part of the Appalachian Mountains and contains some of the most remote wilderness in the two forests. Visitors can forget about hotels and can take a break to enjoy the wilderness around them. The scenic byway that is known as the Cherohala Skyway runs across the uppermost peaks of the Unicoi Crest. This overlook provides a good view of the mountains. An interpretive marker helped us to better understand the view. As I looked out from the overlook I noticed that a few things were missing. We were looking at miles of unbroken wilderness. There wasn't a road, bridge, hotel or billboard in sight. The Cherohala Skyway has to be part of a handful of places that can make this claim. We only paused here for a few minutes. After taking in the view we headed for our next stop at Big Junction.